Seattle, WA (February 16, 2017)—A new facility for accelerating the clean energy innovation cycle opened in Seattle today. The Clean Energy Institute (CEI), a research unit at the University of Washington (UW), created the Washington Clean Energy Testbeds to increase the rate at which breakthrough science and engineering discoveries turn into market-adopted clean energy technologies. The state-of-the-art user facility has labs for manufacturing prototypes, testing devices, and integrating systems. 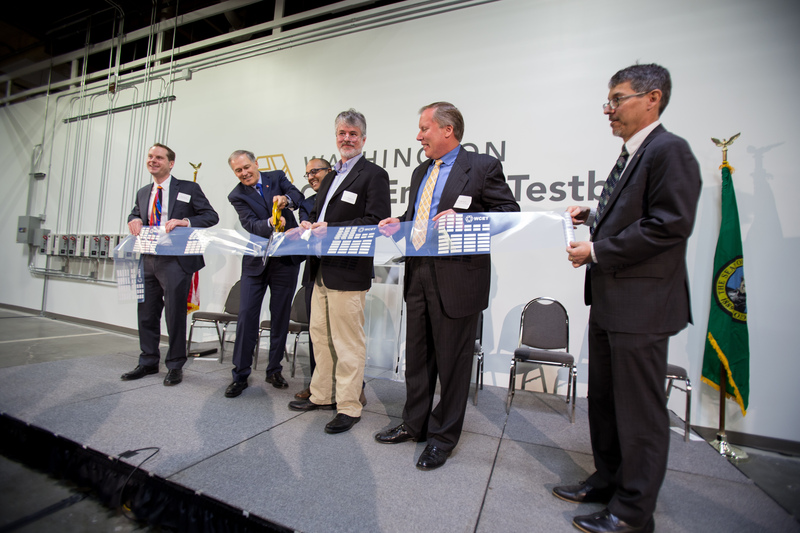 CEI unveiled the Testbeds at a celebration with Washington Governor Jay Inslee, cleantech leaders, and clean energy researchers. Print ultra-low-cost, thin-film solar cells and electronic devices using novel electronic inks. Fabricate and test new battery systems to dramatically increase performance without compromising safety. Develop and test energy management software that controls and optimizes how batteries, vehicles, and buildings integrate with a clean energy grid. The Washington State Legislature provided UW $8 million to plan and design the Testbeds. CEI engaged UW faculty, regional cleantech leaders, and national research institutions like the Pacific Northwest National Laboratory (PNNL) to create a facility that serves clean energy innovators. For comparison, access to public energy research and testbed facilities often involves a competitive application and approval process. The Washington Clean Energy Testbeds’ open-access model requires only an initial consultation with Testbed management to ensure project feasibility and safety. Open-access is ideal for researchers and companies that want to rapidly advance their ideas. Professor J. Devin MacKenzie, a seasoned cleantech entrepreneur and global expert in electronic materials and emerging manufacturing methods for energy devices, displays, and communication, will lead the Washington Clean Energy Testbeds. MacKenzie has founded and led five startup companies and holds over 110 patents and publications. In addition to leading the Testbeds and teaching at UW, he is currently the chief technical officer of Imprint Energy, a UC Berkeley spinout developing flexible, high-energy batteries based on large-area print manufacturing. At the Testbeds, MacKenzie manages a staff of trained experts in fabrication and analysis of energy systems and devices. They work on-site to train users and support research and development efforts. The “Scale-up & Characterization” portion of the Testbeds offers a platform for prototyping authentic-scale solar and storage devices as well as testing manufacturing processes. The lab includes a 30-ft-long multistage roll-to-roll printer for solar cells, batteries, sensors, optical films, and thin-film devices and is the only one of its kind in the United States. The Washington Research Foundation (WRF), an organization that provides grants to support research and scholarship in Washington State, funded this sophisticated instrument and helped recruit MacKenzie and staff to Seattle. The “Scale-up & Characterization” lab also includes a controlled humidity and temperature room to enable specialized fabrication under precise atmospheric conditions. The collection of characterization instruments in the lab form a unique roster of capabilities tailored specifically for supporting scaled energy devices and modules. They allow for rigorous testing of new devices using solar simulators, environmental test chambers, battery cyclers, electron microscopes, X-ray spectrometers and other instruments. WRF Innovation Professor Venkat Subramanian and Kyocera Professor Jihui Yang from UW will use the “Scale-up and Characterization” lab for their work with the Battery500 consortium. Battery500 is a U.S. Department of Energy (DOE) program led by PNNL that aims to develop next-generation lithium batteries that have more than double the “specific energy” found in the batteries that power today’s electric cars. The multi-disciplinary consortium includes leaders from DOE, national labs, universities, and industry, all of which are working together to make smaller, lighter, and less expensive batteries that manufacturers can adopt. The “Systems Integration” lab at the Testbeds provides an evaluation platform for testing the performance of energy devices and algorithms when integrated into real and simulated system environments. For example, a real-time digital simulator (RTDS) allows for modeling commercial and grid-scale system performance under normal and extreme conditions. System integration experiments using the RTDS can involve new software algorithms that control or optimize power infrastructure. The lab also includes flexible power hardware and battery storage devices up to 40 kW in scale, allowing authentic testing at the scale of an electric vehicle or commercial building. Battery Informatics, Inc., a UW spinout company, is using the Testbeds’ systems integration tools to evaluate the performance of their self-learning battery management system. Another research initiative housed at the “Systems Integration” lab includes the Transactive Campus Energy Systems project. This first-of-its-kind regional partnership with UW, PNNL, and Washington State University seeks to develop and demonstrate the technologies to cost effectively balance energy use among buildings, campuses, and cities. Funding for this project comes from the Washington Department of Commerce’s Clean Energy Fund and DOE. UW professors Daniel Kirschen and Miguel Ortega-Vazquez lead this project for UW and Testbeds users can access data researchers are drawing from devices and systems across UW’s campus. In addition to lab space, the Testbeds offer users meeting and office space where they can work, collaborate, and further build their cleantech community. An entrepreneur-in-residence, currently John Plaza, will hold regular office hours. With more than 20 years of experience in the renewable energy sector, Plaza will provide users with insights about the commercialization process, target markets, product development, and fundraising strategies. In summer 2017, CEI will open its Research Training testbed for students on UW’s campus. Part of the Washington Clean Energy Testbeds system, this facility provides UW students access to research-quality tools and training in clean energy concepts that cut across academic disciplines. CEI member faculty will host laboratory courses in the space and Testbeds users can access the additional instrumentation when not in use for teaching purposes.